Phillies rising relief prospect Jesen Therrien has struck out 65 batters and walked just nine in 57 1/3 innings this season. He could join the Phils' 'pen on Friday. Two weeks and two days after representing the Phillies in the All-Star Game in Miami, Pat Neshek made the short trek down I-95 from Philadelphia to Washington on Thursday, where he’ll join his new Colorado Rockies teammates before they open a weekend series with the Nationals. Colorado entered Thursday four games in front of Milwaukee for the second National League wild card spot. With a potent offense and Neshek joining a bullpen with sturdy backend relievers Greg Holland and Jake McGee, it should be a good marriage between contending team and playoff-proven veteran. As for the team he just departed, there’s at least a chance Neshek, who turns 37 in September, could return to Philadelphia as a free agent. The Phillies obviously liked what the likable right-hander brought both on and off the field in ’17 and Neshek was more than complimentary for a team that gave him new life as a back-end reliever after being buried as a situational guy in Houston a year earlier. But that’s for another day. The Phillies have more than a few other things to take care of between now and the beginning of free agency, including getting the three players they got in return for Neshek acclimated with their new organization. Late Wednesday night, we broke down all of the essential details of the trade, including info on those players: shortstop Jose Gomez and right-handers Alejandro Requena and J.D. Hammer. Nothing is 100 percent set in stone, but Requena is likely bound for Low-A Lakewood while Gomez and Hammer would report to Class A Clearwater. Now that that’s settled, here are a few of the more pressing issues the Phillies will face in the next few days. Who's Filling the Bullpen Void(s)? The Phillies still have a hole in their bullpen with Neshek’s departure and will fill it before they take the field against the Atlanta Braves on Friday at Citizens Bank Park. Actually, they have two holes, since Jake Thompson’s temporary stay as a fresh arm in the ‘pen is set to end so he can return to the rotation at Triple-A, too. The Phillies have an opening on the 40-man roster and more than a couple of options. They could decide to call back one of the pitchers who have already seen significant time on the big league roster. 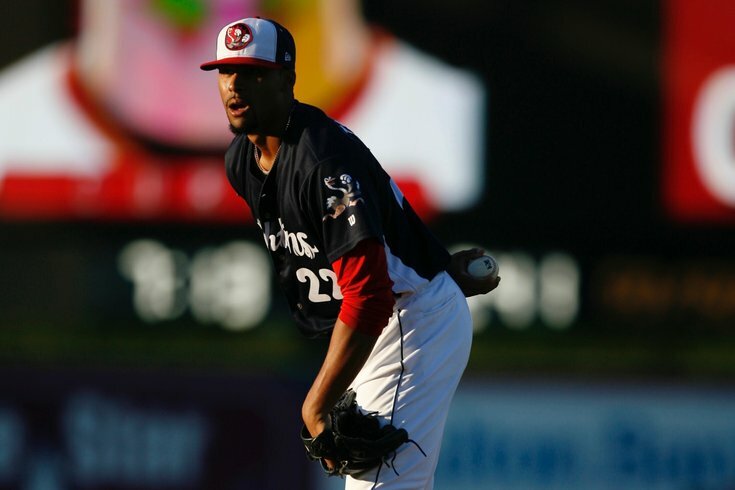 Edubray Ramos, who is still just 24 and showed promise a year ago, has a 1.69 ERA and has been scored on in just one of his nine outings since being demoted to Triple-A Valley. Ben Lively is also still with the ‘Pigs, but isn’t likely to return to the Phillies until there’s a rotation opening. Mark Leiter has played a regular role in the ‘pen before and could be a possibility. Ricardo Pinto hasn’t been down long enough to be called back up just yet. The feeling here is it’s time to give Jesen Therrien, who isn’t on the 40-man roster, his first taste of the big leagues. The 24-year-old Therrien has arguably been the best reliever in the system in ’17 and is equipped to get big league hitters out with a mid-90s fastball and a slider that has left many evaluators more than a little impressed. Therrien has a 1.88 ERA, 0.837 WHIP, 65 strikeouts and nine walks in 57 1/3 innings over 39 games between Triple-A and Double-A Reading. He’s allowed one run over his last 13 games (19 1/3 innings) with the IronPigs. He’s ready. It would be hardly surprising if the Phillies called on both Therrien and Ramos on Friday to fill their two voids. UPDATE: Ramos was apparently placed on the DL today at Lehigh Valley. So Therrien and... Leiter? Ten days ago we identified the six most likely Phillies to move before the trade deadline. One of them is already gone, of course. Just five days ago we reminded everyone that, just because a deal doesn’t get completed before the 4 p.m. deadline on Monday doesn’t mean the Phillies still can’t move players to new teams next month. • Jeremy Hellickson hasn’t been very good of late. The 30-year-old veteran has a 6.04 ERA in four starts this month. And he’s allowed 20 home runs in 15 starts since the beginning of May. The Phils are motivated, because they have Lively waiting at Triple-A, but it takes two to tango… er make a trade. Joaquin Benoit also fits into this category, although teams might be more willing to take a flyer on a reliever if it costs next to nothing. • Howie Kendrick can't stay healthy. He’s been on the disabled list twice this season with leg issues and had to exit Wednesday’s game after getting hit on the hand with a pitch (initial reports are he’ll be good to go for this weekend). Still, this feels more like a guy who moves next month, after he’s shown he can stay on the field for more than a couple of days in a row. Daniel Nava, placed on the DL Wednesday, also fits into this category. What about the Less-Obvious Trade Candidates? Tommy Joseph might not be best categorized as less obvious because of the first base conundrum the Phillies will face in the season’s final two months. But, unlike the players listed above, Joseph, who only turned 26 earlier this month, is not a veteran about to hit free agency and is under club control for five more years. So, it’s complicated. Unlike, say, J.P. Crawford, who also has to be added to the 40-man roster this winter, Rhys Hoskins is a shoo-in for a call-up at some point before the end of 2017. After hitting 38 home runs at Double-A last year, the 24-year-old Hoskins is slashing .284/.380/.570 with an International League-best 24 home runs in 102 games. A timeshare at first base could be coming, since the Phillies, even with Hoskins ready, shouldn’t just give Joseph away. Joseph was a top hitting prospect in his own right, has shown some promise in the last year: he’s batting .265 with 28 home runs, 31 doubles, and a .819 OPS in his last 162 games played. That’s not a bad start. And plenty of young hitters and former top prospects have blossomed into a better version of themselves as they get further into their big league careers, including Jayson Werth once upon a time here in Philly and, this year, a guy like Yonder Alonso out in Oakland. Speaking of Oakland, maybe they made sense for Joseph if they deal Alonso (a free agent at season’s end) before Monday's deadline. Regardless, don’t look for the Phils to give Joseph away in the next four days. They can revisit their first base conundrum this winter.